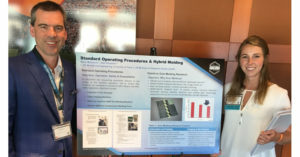 Matt Litzler attended the Institute for Advanced Composites Manufacturing Innovation (IACMI) Members Meeting in Knoxville, TN and enjoyed meeting the student that wrote the Litzler Prepreg SOP. The meeting highlighted advancements in all IACMI technology areas, member successes, technical project updates, workforce development initiatives, and much more. © 2017 C.A.Litzler Co., Inc. Cleveland, Ohio, USA All rights reserved.